You've probably seen the UEFA Champions League Winners, Manchester United, wearing a patch in the center of their shirts as of late. 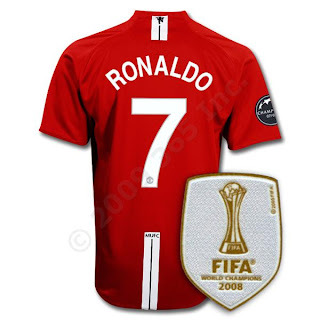 Well, that is a special FIFA badge in honor of their Club World Cup victory in 2008. And we've got it for you now! On Wednesday 11 March, FIFA President Joseph S. Blatter and Secretary-General Jerome Valcke at Old Trafford, a new addition to the boardroom was unveiled: a revised honours list. In the central section, which highlights United's Premier League, First Division championship [the forerunner to the Premier League] and UEFA Champions League successes was a new section, devoted to the FIFA Club World Cup and their victory in Japan last December. It symbolized the pride that the club has taken in their historic victory. Blatter and Sir Alex Ferguson proudly introduced the Manchester United shirt - complete with its new addition; the FIFA Club World Cup Champions badge.